Background: Bacterial infections remain an important cause of pediatric mortality and morbidity. It might be possible to reduce these factors by early diagnosis and proper management. Aim: The aim of the study was to analyze the bacteriological profiles with their antibiogram, and to register the risk factors for septicemia in neonates and infants. Setting and design: This observational cross-sectional study was conducted in a tertiary care teaching hospital at Gangtok, Sikkim, India, and included clinically suspected cases of septicemia in neonates and infants. Materials and Methods: Blood culture reports were studied in 363 cases of clinically suspected septicemia in neonates and infants, using the standard technique of Mackie and McCartney. The antibiotic sensitivity was performed by Kirby-Bauer's disc diffusion method. Risk factors for sepsis in the children were registered. Results: Blood culture was positive in 22% of cases. Gram-negative septicemia was encountered in 61% of the culture-positive cases. Pseudomonas and Enterobacter species were the predominant pathogens amongst gram-negative organisms. Most gram-negative organisms were sensitive to Amikacin, Ciprofloxacin, and Co-trimoxazole. The most common gram-positive organism isolated was Staphylococcus aureus (97%). More than 70% of Staphylococci isolated were resistant to Penicillin, but were sensitive to Clindamycin (70%) and Vancomycin (40%). The most important risk factors of septicemia in our study population were preterm birth (31%), followed by respiratory distress (5%) and low birth weight (4%). Conclusion: As the cultures showed variable antibiogram with complicated patterns of resistance, culture and sensitivity test should be performed in all cases of septicemia. Furthermore, facilities for bacterial culture are not available in most peripheral health facilities in developing countries and neither are pediatricians. Early diagnosis and proper management of neonatal septicemia could bring down the morbidity and mortality substantially. Little is known about the prevalence and incidence of septicemia in the neonates and infants in Sikkim. Hence, the present study was undertaken to study the bacteriological profile and the antimicrobial sensitivity pattern of septicemia in neonates and infants. To the horizon of our knowledge there has been no study done in this field in the state of Sikkim. Study period: January 15, 2007 to January 14, 2008. Study population: This observational cross-sectional study was carried out at a tertiary care 500 bedded teaching hospital at Gangtok, Sikkim (India) having regular OPD and In-patients department with full-fledged medical and surgical ICU, PICU, and NICU. The study included 363 cases of clinically suspected septicemia in neonates and infants. Signs and symptoms of sepsis included: temperature instability, feeding difficulties, respiratory distress, jaundice, convulsions, and autonomic disturbances. The main outcome measures were microbiologic spectrum of blood cultures and the following risk factors: prematurity (<37 weeks), low birth weight (<2500 g), respiratory distress, and neonatal jaundice. Data collection procedure: Institutional ethics committee approved the study. All the caregivers of the patients were explained about the purpose of the study and were ensured strict confidentiality. Written informed consents were taken from each of the caregivers of the children prior to the study. Following Helsinki Declaration on research bioethics, the participants and their caregivers were given the options not to participate in the study if they wished. The standard microbiological methods were followed in this study during blood culture and antibiotic sensitivity test. Blood samples were collected with all aseptic precautions for culture and sensitivity studies following universal precautions. Blood cultures were processed using the standard technique described by Mackie and McCartney  and the antibiotic sensitivity was performed by Kirby Bauer's disc diffusion method, as recommended in the National Committee for Clinical Laboratory Standards (NCCLS) guidelines. The aerobic isolates were studied. Gram staining was performed and organisms were identified based on their colony characteristics and biochemical properties. The data analysis involved transcription, preliminary data inspection, content analysis, and interpretation. Percentages were used in this study to analyze epidemiological variables. In our study, 363 blood samples were collected from neonates and infants who were admitted with signs and symptoms of sepsis. Out of these, 363 clinically suspected cases of septicemia, 249 (69%) were term and 114 (31%) were preterm babies. The age of onset of septicemia was quite variable in the children in our study. Clinical suspected septicemia was observed in 203 neonates (56%), in 112 infants (31%) from 29 days to12 months of age, and 48 infants (13%) above 12 months of age. The most important risk factor of suspected septicemia in our study population was preterm birth (31%), followed by respiratory distress (5%), low birth weight (4%), and neonatal jaundice (4%). Overall, in the clinically suspected cases of septicemia in our study population a blood culture positivity rate was observed to be 22% of 363 infants [Table 1]. The most common gram-positive organism isolated was S. aureus (97%). Only a single isolate of Coagulase negative Staphylococci was found (among the children from 29 days of age up to12 months). The most common gram negative organism were the Enterobacter species (25%) followed by the Pseudomonas species (20%) [Table 2]. The risk of specific infections was related to the age of the child. Only in neonatal cases Klebsiella, Citrobacter, and Acinetobacter species were isolated. 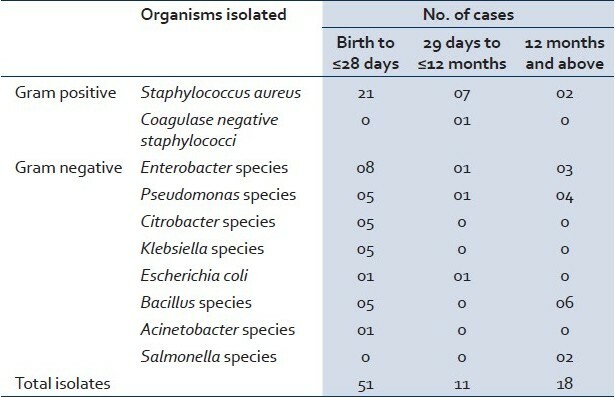 Escherichia More Details coli and Coagulase negative Staphylococci were isolated from cases below one year, whereas Salmonella More Details species were isolated only from two cases after infancy as a causative organism in septicemia [Table 2]. For the effectual management of septicemia cases, study of bacteriological profile along with the antimicrobial sensitivity pattern plays a noteworthy role. Out of the 363 clinically suspected cases of sepsis in our study, 80 were culture positive with a blood culture positivity rate of 22%. Gram-negative septicemia was encountered in 61% of the culture positive cases. A high blood culture positivity rate in septicemic children (56%) had been reported by Sharma et al. However, a lower positivity rate (36%) was observed by Mondal et al,  which was comparable with the present study. Chow et al, had reported that 26% of all neonatal septicemias were caused by anerobes. A low blood culture isolation rate in this study might be due to several reasons, like administration of antibiotics before blood collection or anerobic bacteraemia. The antimicrobial sensitivity pattern differs in different studies as well as at different times in the same hospital in Indian and overseas studies. ,, This is mainly a result of indiscriminate use of antibiotics. In our study, we observed that penicillin resistance was found in 70% of the S. aureus strains and the single Coagulase negative staphylococci (CoNS) strain. Similar high rate of penicillin resistance against S.aureus (95%) and CoNS (90%) was seen in a study conducted in Lucknow. In our study, S. aureus showed a sensitivity of 70% to Clindamycin and 40% to Vancomycin. Most of the gram-negative organisms were sensitive to Amikacin, Ciprofloxacin, and Co-trimoxazole. Multiple drug resistance was seen in Enterobacter, E.coli , Klebsiella, and Salmonella species. There is neither any routine for analyzing blood cultures in suspected septicemia nor for antibiotic treatment of neonates/infants with suspected sepsis in our centre. We have conducted this study to describe the antibiotic susceptibility pattern to propose our "Hospital Infection Committee" to formulate a revised standard operating procedure. The strength of this study lies in describing patterns of microbiological behavior from an area where this is not routinely done. This study presented an analysis of septicemia in a tertiary healthcare center in northeastern India. Local microbiological databases suggesting the best choice of antibiotics for different age groups are important for the local physicians when treatment of the septic infant has to be initiated before the result of the blood culture is known. The authors suggest that a local dynamic database has to be established. This should contain relevant data on the positive blood cultures. 1. Sanghvi KP, Tudehope DI. Neonatal bacterial sepsis in a neonatal intensive care unit: A 5 year analysis. J Paediatr Child Health 1996;32:333-8. 2. Zaidi AK, Thaver D, Ali SA, Khan TA. Pathogens associated with sepsis in newborns and young infants in developing countries. Pediatr Infect Dis J 2009;28:S10-8. 3. Meremkwer MM, Nwachukwu CE, Asuquo AE, Okebe J, Utsalo SJ. Bacterial isolates from blood cultures of children with suspected septicemia in Calabar, Nigeria. BMC Infect Dis 2005;5:110-5. 4. Roy I, Jain A, Kumar M, Agarwal SK. Bacteriology of neonatal septicaemia in a tertiary care hospital of northern India. Indian J Med Microbiol 2002;20:156-9. 5. Anuradha DE, Saraswathi K, Gogate A, Fernandes AR. Bacteremia in hospitalised children: A one year prospective study. Indian J Med Microbiol 1995;13:72-5. 6. Sharma M, Yadav A, Yadav S, Goel N, Chaudhury U. Microbial profile of septicemia in children. Indian J Pract Doct 2008; 5: 16-8. 7. Collee JG, Marr W. Culture of Bacteria. In: Collee JG, Fraser AG, Marmion BP, Simmons A, Eds. Mackie and McCartney Practical Medical Microbiology. 14 th ed. New York: Churchill Livingstone; 1996. p. 113-29. 8. Sharma PP, Halder D, Dutta AK, Dutta R, Bhatnagar S, Bali A, et al. Bacteriological profile of neonatal septicemia. Indian Pediatr 1987;24:1011-7. 9. Mondal GP, Raghavan M, Bhat BV, Srinivasan S. Neonatal septicemia among inborn and outborn babies in a referral hospital. Indian J Pediatr 1991;58:529-33. 10. Chow AW, Leake RD, Yamauchi T, Anthony BF, Guze LB. The significance of anerobes in neonatal bacteremia: Analysis of 23 cases and review of literature. Pediatrics 1974;54:736-45. 11. Mathur M, Shah H, Dixit K, Khambadkone S, Chakrapani A, Irani S. Bacteriological profile of neonatal septicemia cases (for the year 1990-91). J Postgrad Med 1994;40:18-20. 12. Freedam RM, Ingram DI, Gross I. A half century of neonatal sepsis at Yale. Am J Dis Child 1981;13:140-4. 13. Somu N, Shetty MV, Moses LG. Subramaniam L, Raju VB. A critical analysis of septicemia in infancy. Indian Pediatr 1976;13:443-60. 14. Bhakoo ON, Agarwal KC, Narang A. Prognosis and the treatment of neonatal septicemia: A clinicobacterial study of 100 cases. Indian Pediatr 1974;11:519-28. 15. Sankar MJ, Agarwal R, Deorari AK, Paul VK. Sepsis in the newborn. Indian J Pediatr 2008;75:261-6. Downie, L. and Armiento, R. and Subhi, R. and Kelly, J. and Clifford, V. and Duke, T.
Malla, K.K. and Malla, T. and Rao, K.S. Basu, S. and Dewangan, S. and Shukla, R.C. and Anupurva, S. and Kumar, A.